SHIPS FAST- In stock in multiple colors. For example Chocolate and New Winered Paloma ship within 1 business day. 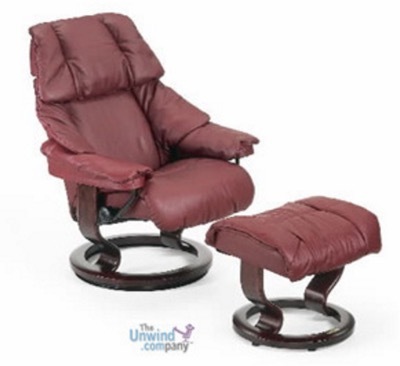 It's always a terrific time to purchase an amazing Stressless Reno Small Recliner and Ottoman at the Unwind Company. Choose from a wide variety of beautiful leather and fabric types and colors when purchasing the Reno Recliner! Checkout these accessory options. The simple Swing Table, the ultra-convenient Personal/Laptop Table, the useful Ellipse Table, the stylish Urban Table, or the fan-favorite Elevator Ring set. The pricing is automatically reflected when you make your leather/fabric selection from the colored swatches above. Need assistance- Please call 1-888-486-9463. Enjoy Fast & Safe Delivery on a Stressless Reno Small Recliner with Ottoman. 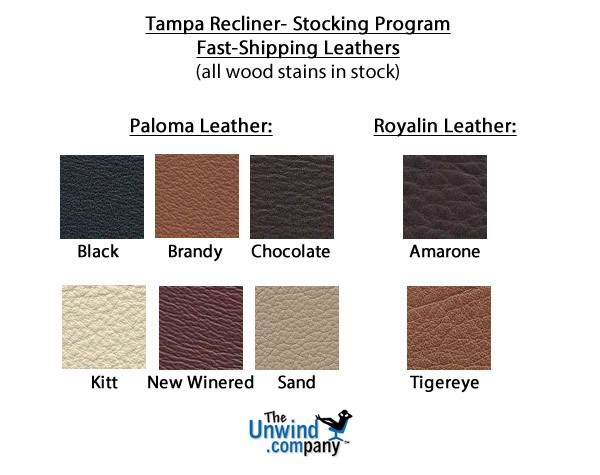 Choose between a wide variety of leather or fabric types and colors and a wide assortment of different wood stain options in all three sizes. Start relaxing in your beautiful new Reno Small Recliner sooner with our Quick and Easy Shipping Methods. It's a great time of year to purchase from the amazingly comfortable, Stressless Reno Small Series! This popular, modern recliner delivers exquisite head, neck and back support and the over-stuffed smooth, soft, cushioning allows you to sit undeterred for many hours on end. The Stressless Reno Small recliner is among the most modern Stressless recliners available. Choose one of the many beautiful leather or fabric types and colors by using the pull down menu above, which is titled: "Select Leather or Fabric Type and Color". We also delivery Fully-Assembled, Brand-New items right through the front door of your business or home with the Fastest Shipping Methods available. Our multiple Delivery Options allow in-stock Recliners delivered to virtually anywhere in North America in 1-5 business days. There's no need to pay for standard shipping when you can have Priority Shipping at the same price. All of our items are backed by the rock-solid 10 year Manufacturer's Warranty at no additional cost. You can truly relax and unwind when you choose the world's most advanced recliners. From the patented technologies, to the outstanding construction and engineering, down to the incredibly useful accessories, you will be able to relieve stress and tension and promote a genuine sense of well-being in this seating solution. The Stressless Tampa, Reno Recliner and Vegas Models provide you multiple choices to find that seat that fits just right. These models are neither too firm or too soft. They are just right! This well-known series insures proper head, neck and back support and includes slightly stuffed, extra-leather comfort pockets that add to the smooth, soft, cushioning. The Tampa, Reno, Vegas recliners allow you to sit without strain or sore muscles for many hours on end. These recliners have been among the best-selling Stressless recliners by Ekornes for many years. Want to add a matching Stressless Sofa, Loveseat or Sectional? You’re in luck as there are 3 different models that match this style beautifully. The Eldorado Sofa, The Traditional Oslo Sofa, and the sleek Ekornes Manhattan Series. Ekornes Paloma Specials that will save you $1000’s. Simply choose a matching Paloma leather sofa or sectional model and watch the savings stack up! Choose White Glove Delivery on the Stressless Tampa- Save time and $100's on delivery & sales tax benefits - You pay for your beautiful recliner chair and let us worry about the rest. Are you interested in financing your purchase? We have wonderful news. We have different financing opportunities to suit your needs. Choose a financing option that will suit your budget and help get you the comfort you need. Choose PayPal Credit for their flexible payment options and familiarity when purchasing the amazing Stressless Reno Small Recliner and foot stool. Finance your purchase, relax with flexible payment options and pay the balance off over time. Remove the pressure of shopping and truly relax and unwind. Easy Payments with PayPal Credit lets you get the comfortable Stressless Furniture when you want it, and budget your payments as you go. You can choose the monthly payment amount and the length of time that works best for you. After all, who know you better than you? Pay with peace of mind. PayPal will notify you when each monthly payment is due, so all that’s left to do is sit back, relax, and enjoy your purchase. Our Nationwide White Glove Delivery means that we will bring your recliner, office chair, sofa or sectional into your home (or office), unpack it, set it up and take the box/packaging with us when we leave. Of course your furniture will arrive fully-assembled and ready to enjoy! Would you prefer to receive your Stressless Tampa Recliner with Ottoman faster? Choose one of our other delivery methods. Choose Inside or White Glove Delivery at Unwind.com. Plush, cozy comfort with dreamy lumbar, head and neck support, make the Tampa Recliner a Stressless favorite. With a soft feel and supportive personality, the Tampa easily replaces those old-fashioned, back-busting recliners of yesteryear with style and healthy features your body longs for. Enjoy Fast nationwide delivery everyday from The Unwind Company! Like its larger brothers (the Stressless Reno recliner and the Stressless Vegas recliner), theStressless Tampa recliner is one of our most popular Stressless recliners. It's easy to see (and feel) why, once you sit down, kick-up your feet and feel what Norwegian comfort is really all about. Add a stunningly beautiful Stressless Laptop-Accessory Table, Ekornes Ellipse Table, or Swing Table and you might find that the Stressless Tampa Recliner is your most productive place to work... "Hey, you can save fuel and reduce back and neck strain at the same time!" Now that's an "economic stimulus" that can bring home real positive results. So, we expect that since the "company car" might be losing some ground as far as perks go, we'd like to recommend a perk that will continue to deliver for years to come- a Stressless Tampa recliner. Could someone please call our supervisor and mention this idea? We're thankful for the car, but gas prices tend to stress us out. We have many Tampa recliners in stock in multiple locations which allows us the ability to ship your recliner extremely fast and have it delivered quickly from coast to coast. Please call 1-888-486-9463 and you can be enjoying your Stressless recliner much faster than you ever imagined. Of course there are some restrictions on this service and sadly, it is not available everywhere. Patented Plus System™ which provides continuous support for your head and lower back. There are plenty of chairs that promise lumbar support. 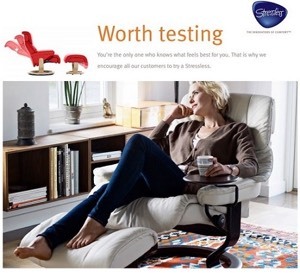 Ekornes is the only manufacturer that provides Lumbar Support in ALL positions. Seated upright, the lumber support is most pronounced. As you begin to recline, you will notice the lumbar support begins to adjust so you can lay comfortably, in a natural posture. Stressless recliners relax your entire body by providing perfect balance and optimum support. You may notice that the Tampa, Reno, & Vegas recliners are low to the ground. This is one of the many intentional design characteristics. A low seat height ensures a low center of gravity. This not only prevents "tipping" when reclining back but also makes your chair easy to get in and out of in a hurry. If you would like to raise the height of your Stress less chair, view our Elevator Rings. These can add 1.3" of height and always ship fast to locations in the Continental United States. With the Stressless Glide System, you can automatically shift to any seating position by simply using your body weight. When you first receive your recliner, we recommend adjusting the black knobs on each side of your recliner to maximize your seating experience. They both turn clockwise, so turn the right hand one forwards and the left hand one backwards to tighten them. This will make your remain upright and require more weight to recline the seat. A few adjustments can allow the chair to be receptive and adaptative to your body's every movement. The lightweight ottoman is the ideal foot rest. It is compact and because it is not attached to your chair, you can move it as close or as far from your seat as you like. Ekornes knows that no two people are alike and allows you to customize your seating to ensure maximum comfort and maximum relaxation. These ottomans also feature a built-in Tilt System that adjusts to your body movements for the ultimate in comfort. You can now purchase additional ottomans for your recliner. View Ekornes Ottomans. Stressless Recliners are created for a custom fit. All models feature matching Medium and Large Sizes. Some models have 3 sizes: Small, Medium, & Large. The Tampa recliner is the "small" recliner in the Stressless Tampa, Stressless Reno (Medium), or Stressless Vegas (Large) line from Ekornes. It is no wonder that Stressless Tampa Recliners are Exclusively Endorsed by the American Chiropractic Association. Come visit the Unwind Back & Body Store to experience the Ekornes Stressless Reno Small Recliner for yourself. If you have already decided and are ready to purchase, simply click the "Add To Basket" button and begin selecting the available options. Please review our return policy prior to ordering or call 888-486-9463 for personal assistance. You may also email stressless@unwind.com anytime- 24 hours - 7 days a week. 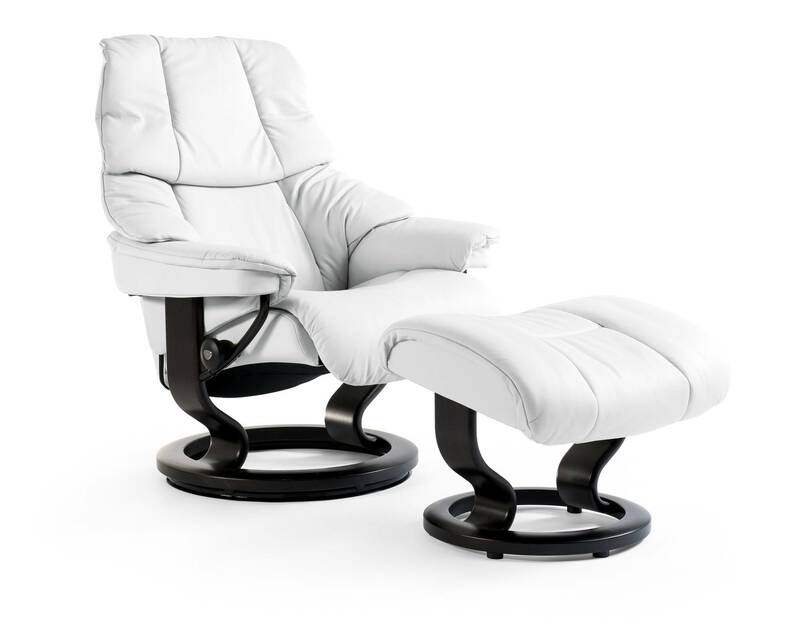 Have questions or need additional information about the Ekornes Stressless Tampa or other Ekornes Recliners? Please contact us at stressless@unwind.com or at 1-888-4-UNWIND (888-486-9463). We're here to assist you with your Stressless Vegas Recliner or other Soothing Back Product or Furniture purchase. I bought 2 recliners chairs and fit us very well. Back and neck area are well supported. Sitting there feel very relaxing and we enjoy it very much. Is recommendable! Love this chair! There is no better recliner.